OPE FRANCIS appears to be less interested in Liturgy than his immediate predecessor, Pope Benedict XVI. Some are asking, “What will become of the Liturgical movement called for by Pope Benedict and popes before him?” While I have no inside information, I can say that at this time I see no cause for alarm. First of all, the strength of the Liturgical movement relies on objective truth. It does not rely on the current Pope. It must be judged by its merits. It must continue to build upon truth, not decrees. After all, there have been many times in the history of the Church when a bad Pope was reigning (and note carefully I am not for one second implying Pope Francis will be a bad Pope). However, during these times, good priests and Bishops simply continued to do the Lord’s work. They did not all of a sudden start wrecking the Liturgy on the local level. The local level is what’s important. Each individual’s relationship with Jesus Christ is what’s most important. The example to follow is Dr. Theodore Marier, who continued to build a wonderful Church music program in spite of all kinds of difficulties from the hierarchy. Furthermore, the wonderful documents of Pope Benedict XVI will not cease to exist because he is no longer Pope. Are they true? If they are, their truth will continue to endure and inspire. 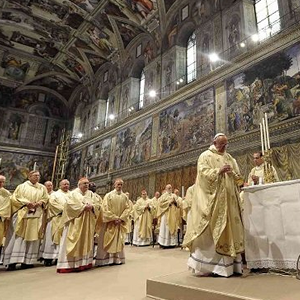 Finally, because of Pope Benedict XVI’s Papacy, what he wrote, and what he did, it is no longer possible for anyone to say that the Second Vatican Council outlawed reverent Liturgy. Thanks to the Pontificate of Benedict XVI, it is perfectly clear that Vatican II encouraged Latin, choirs, dignified music, ad orientem, beautiful vestments, and so forth.